Somehow, on a rainy Monday afternoon, I find myself crawling around on the floor of a primary school classroom, pretending to be a lion. 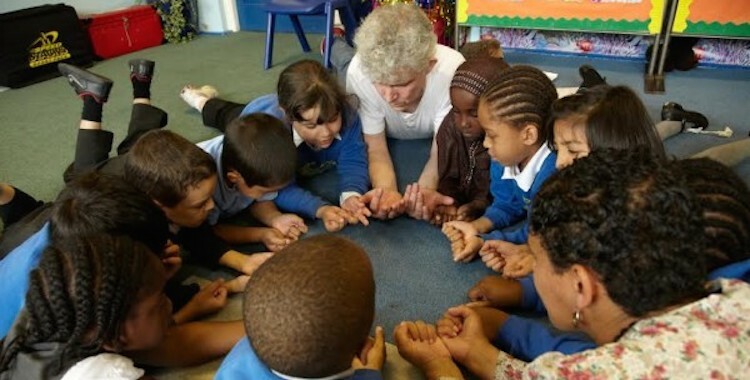 I’m taking part in Speech Bubbles, London Bubble Theatre Company’s Key Stage 1 schools programme. I came along with the intention of watching quietly from the sidelines, but the only real way to get a feel for this kind of work is to get stuck in. So over the course of an hour I’m a tree, an adventurer, a monkey, a dragon and, yes, a lion. It might not sound all that different from games usually found in the playground, but the silliness and role-play is part of a structure that is all about storytelling and, crucially, theatre. From an educational perspective, Speech Bubbles has a proven track record of improving communication skills, helping children to listen to others and to express themselves. But at the same time, this is theatre on the most small-scale, everyday of levels, happening quietly and without fuss at schools across the city. As arts funding continues to be threatened, the argument is regularly put forward that theatres need to embed themselves at the heart of their communities. If those buildings and companies really mean something to local people, then their audiences will fight for them. It’s an argument I agree with. But I wonder whether theatre is already built into more people’s lives than the theatre community itself recognises. Theatre isn’t just what’s on in the West End or at the Royal Court or even in tiny, alternative venues like Camden People’s Theatre. It’s happening in village halls and community centres, in parks and in schools. So why aren’t we claiming all of this work? A while back, playwright and campaigner Fin Kennedy suggested an idea that he dubbed “I Am British Theatre”. As a way of tackling the public perception that everyone who works in theatre is a privileged, air-kissing luvvie, he proposed that ordinary theatre-makers talk about the reality of the industry in a series of blog posts or short films, stripping away the gloss of showbiz glamour. The message was to be that it’s not all champagne and red carpets. It was a great idea in lots of ways, but it cut out a whole swathe of British theatre practice. If we’re talking numbers, the people who really represent British theatre are probably those participating in amateur dramatics groups, those watching their kids in the school show, those going along to a weekly drama class, and those crawling around pretending to be lions at 2pm on a Monday. This is how theatre really enters and animates people’s lives. It’s less showy, less exciting, less overtly theatrical, but it’s completely embedded in the rhythms of life. To return to Speech Bubbles, this simple process of sharing, telling and acting out stories offers children the opportunity to engage in theatre as author, performer and audience member – sometimes all three at once. It also positions these roles as fluid, creating a relationship with theatre that is active and curious from the beginning. Perhaps most importantly, it tells its participants that they have stories that are worth listening to, something they might not be used to hearing in a world in which, as theatre-maker Hannah Nicklin puts it, capitalism has stolen our stories and sold them back to us. This is just one example, but it points towards a huge, largely invisible section of this country’s complex theatre ecology. While it’s not often talked or written about, and in many cases doesn’t even carry the label “theatre” for its participants, it’s a vital entry point to the art form. And often it goes on to feed the system that it’s an unobtrusive part of, igniting the first spark that inspires those kids in primary school classrooms to continue making theatre in one form or another. The important thing to recognise is that it is all theatre. Theatre isn’t necessarily for everyone, in the same way that football or knitting or heavy metal music isn’t necessarily for everyone. It can be easy to forget that in the zeal that surrounds audience development initiatives. Not everyone wants to be an audience member, and that’s OK. But plenty of the people who are supposedly so difficult to reach are already engaged in theatre, whether they recognise it as theatre or not. And maybe those of us so invested in doing the reaching out could try a little harder to see those hidden participants.